I am so excited to have Gail from Probably Actually on the blog today! Gail is an incredible sewer. She has made a closet full of clothes for her daughter and those clothes are impeccably made. Now that she has a little boy on the way (congratulations, Gail!) we are in store for some classy boy duds! 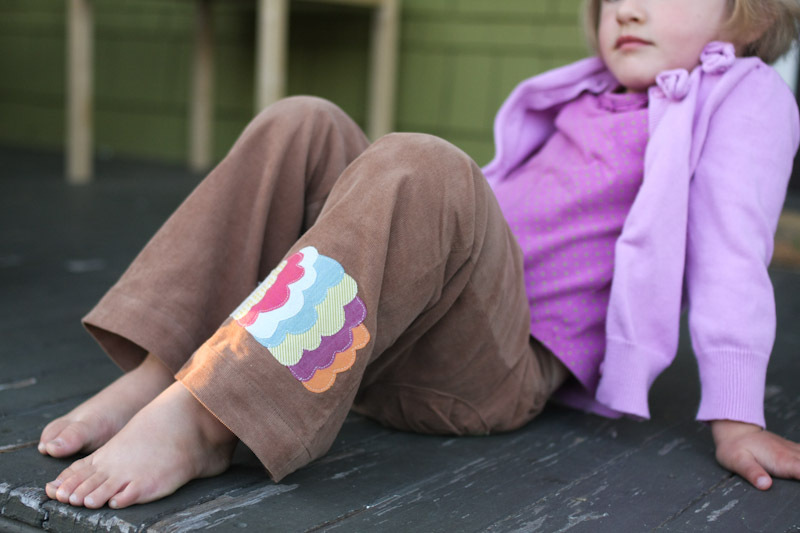 Instead of changing up the Kid Pants pattern, Gail embellished her pants with adorable-ness. Check it out! Hello! I’m Gail from Probably Actually and I’m crazy excited to be part the pre-KCWC line up! There isn’t much I love more than making kids clothes, and it only gets better during KCWC. As you may have experienced yourself, lugging a sewing machine and serger around town to sew with friends is pretty impractical, so sewing can sometimes feel a bit solitary and anti-social. But for one week in the fall and another in the spring, Meg transforms it into just the opposite with KCWC. Suddenly we’re all on the same page, scheming about kids clothes, sewing together, and sharing our projects in the ever-inspirational Elsie Marley flickr pool. Get ready, it’s so much fun! 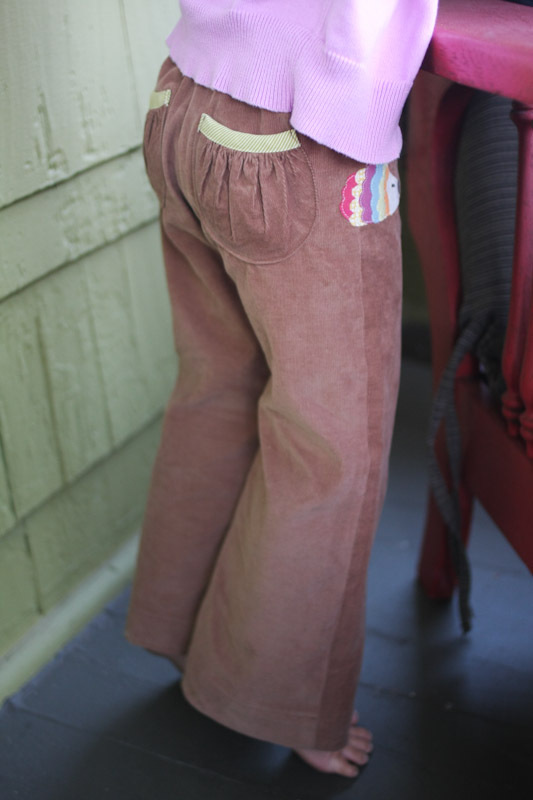 Anyway, today I’m here to help kick off this fall’s KCWC and show you how I jazzed up a pair of Dana’s basic Kid Pants! While there are certainly endless possibilities for changing things up with this pattern, it also yields a great pair of pants without any adjustments at all. The pants are so simple to sew, and I love the flat front option and the wide trouser legs. I didn’t end up making any changes to the pattern itself – I used the size 2/3 downloadable pattern pieces, which worked well for my 3.5 year old (the pattern is made for kids approximately 2 to 3.5 years). There’s plenty of length built into the pattern to make nice wide hems, even when you’re at the farthest end of the pattern range like we were. I did add a few things: Gathered pockets to the back, which I borrowed from the Oliver + S Jump Rope dress pattern (view B). Dana has a great tutorial for gathered pockets as well, if you’re looking. 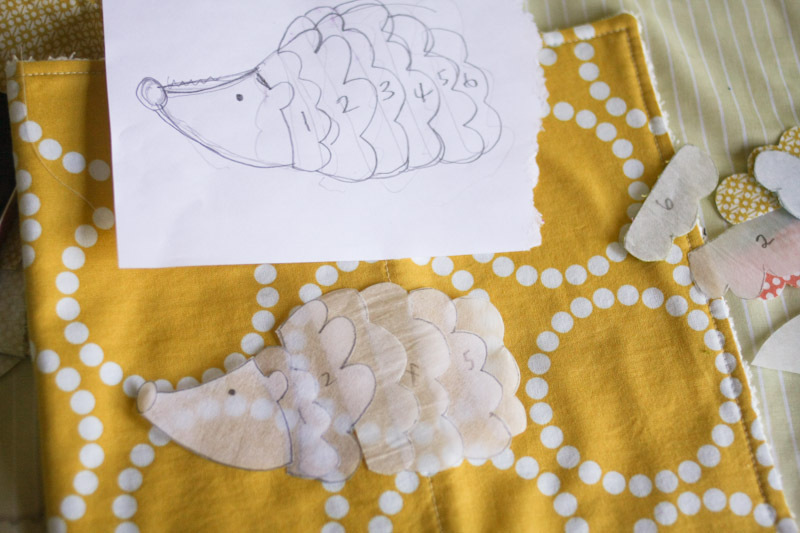 Maybe you recognize the hedgehog if you’re a Mini Boden fan – it was inspired by a sweater I saw on their website awhile back. I loved it immediately, and if I were the type who bought $54 sweaters for my three-year-old, I probably would’ve skipped these pants and ordered the original. But yeah, I made my own instead. Which wasn’t hard to do at all. I sketched the little critter out, then made eight pattern pieces. Next, I traced each piece backwards onto Steam-a-Seam double stick fusible web, then laid those onto the wrong side of fabric scraps, cut them out, and pieced everything back together. I finished it off with a french knot for the eye. And voilà – a hedgehog was born! Sewing around all those little pieces was a bit tedious, and might have been easier to do before the pants were fully constructed rather than after, but I didn’t have that kind of foresight at the time and it still worked out just fine. I just used a very small stitch and picked up the presser foot a lot to shift the fabric as I sewed. That’s it! 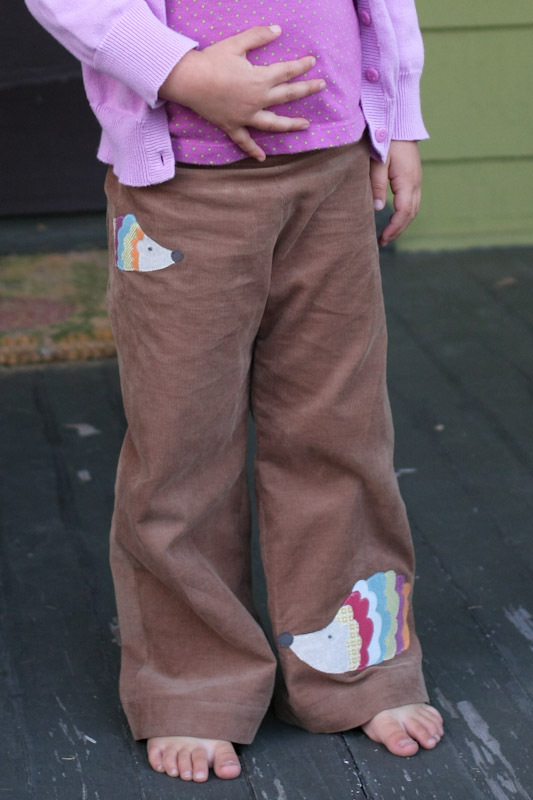 Just your basic corduroy pants adorned with woodland creatures. Thanks so, so much for having me, Meg! I can’t wait for KCWC to get rolling next week!! The basic cords made basically awesome! This is a great way to make a blah pant pop! Thanks for sharing this blogger with us! Gail these are soooooooooo cute! That brown corduroy is just perfect with the details you added. And I can’t believe you appliquéd that so well AFTER the pants were made! See, you are one of my top girl sewing heroes- teach me your ways! I just bought my daughter a season’s worth of pants at a huge consignment sale in Atlanta — only to discover that they are all way too big!! 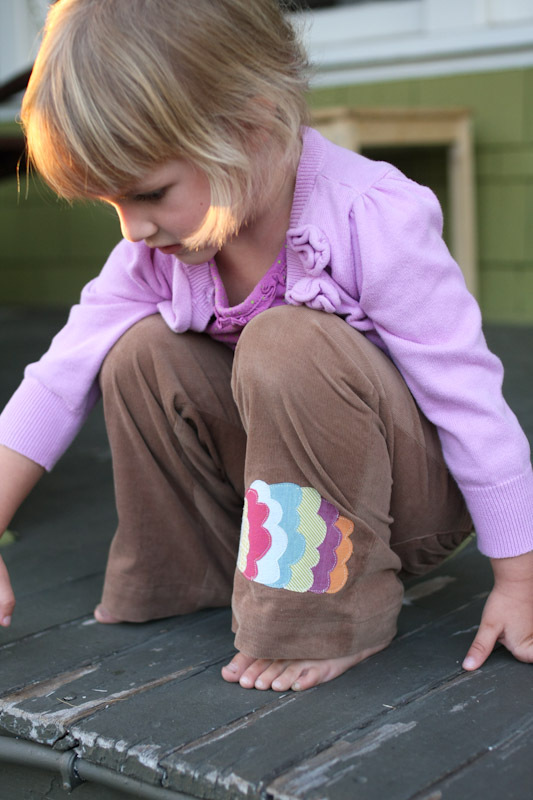 These pants are the perfect inspiration for sewing some perfectly sized and super cute pants for her. Love the extra details. And the corduroy is really perfect. Thanks!! Such a great idea! 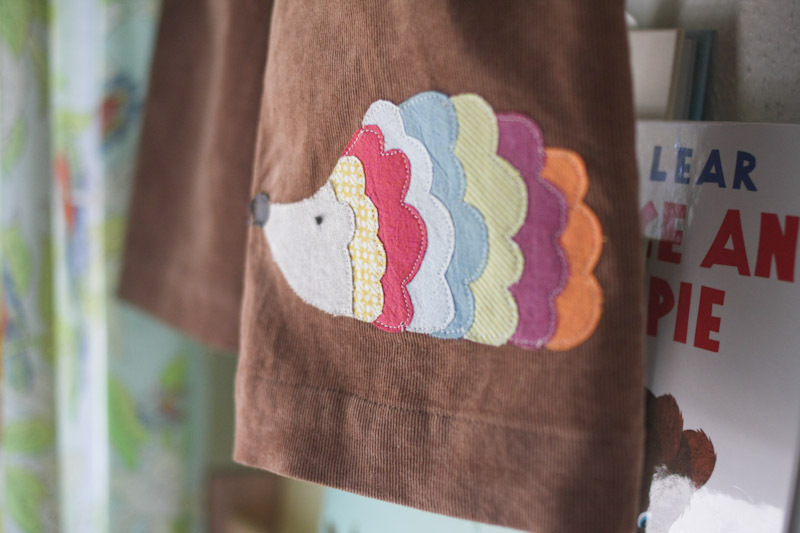 Thanks for sharing this sweet hedgehog Gail- gonna keep it handy on my list-o-stuff to make! Ahhh! That hedgehog. I die. And I too, cannot believe you appliqued them AFTER the pants were sewn together, Gail! What an awesome line-up you have this week, Meg! I can’t wait to see who is up Thursday and Friday! having been lucky enough to have seen these adorable pants in person, i can vouch for the fact that gail’s sewing is truly impeccable – no camera trickery here, folks! i’m just dying over the hedgehogs, too. simply wonderful!! 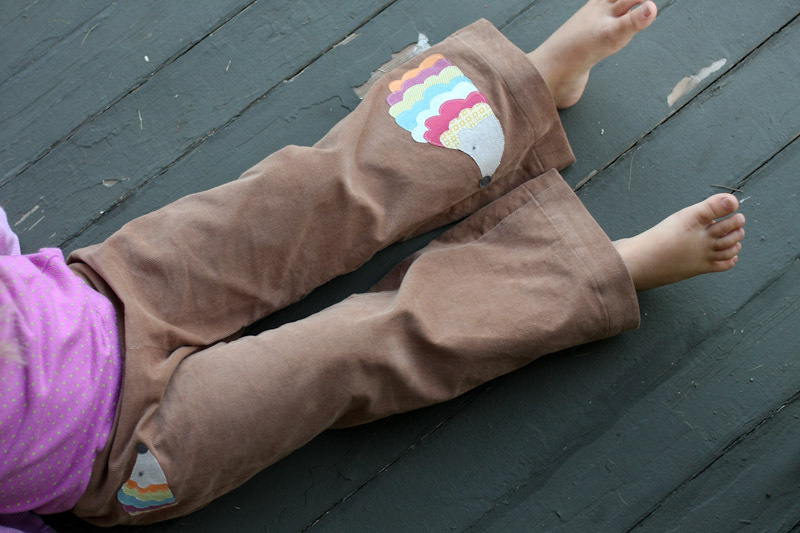 oh my gosh, cutest pants in the whole world. I just want to kiss Gail she’s so fabulous! This hedgehog is soooooooooooo adrorable. I think I’ll put it on few of my girls dresses. They need something cute so my little Miss will choose them to wear. Thank you! So, so cute! I have plans to incorporate an animal or two into my kcwc sewing. I love the accents! The hedgehog and the pockets are great ! thanks for all the sweet comments, everybody – too kind, i tell ya! and thanks again for having me, meg! LOVE them! My first thought was, “hey, I saw that sweater…” :) Great job! This is so, so cute Gail! I love the pop of color, and I’m in awe of your sewing skills, it looks fabulous. What kind of stitch did you use, just zigzag? The one time I tried appliqué, I think I did it by hand, hehehe! (too scared to try otherwise). Loved it, thanks for sharing! And thanks, Meg, for all the inspiration posts–I can’t wait! thank you! i just use a small straight stitch and get really close to the edge – you’ll get a little fraying when you wash it, but i like the way it looks. a tight zigzag is another option if you want to avoid any fray. Those hedgehogs are so cute. I love Gail’s style. Another fantastic mix up of the pattern. Soooo cute! 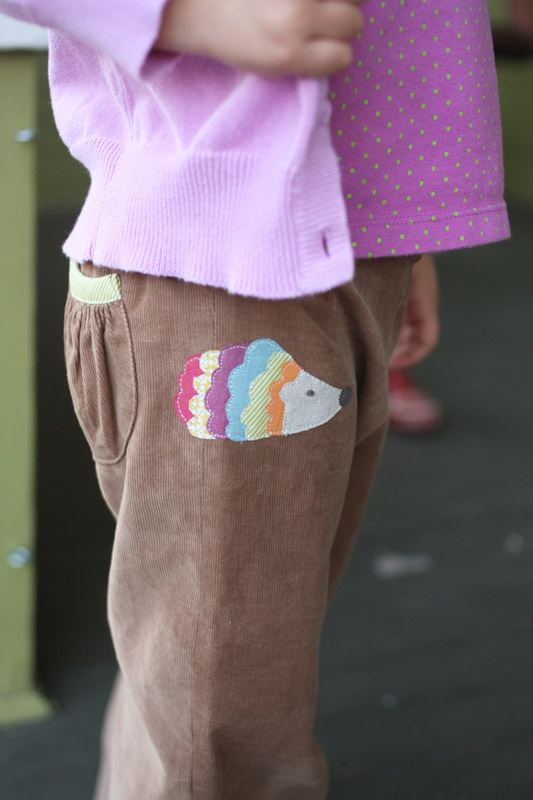 Love the pockets and the sweet hedgehogs! So cool! Thanks Gail. I like to look through Mini-Boden for ideas too and I have been thinking about the chicken appliqué featured in the same issue. Your pants have inspired me to start working on it. Right now.